They've weathered through quite a few storms this year. 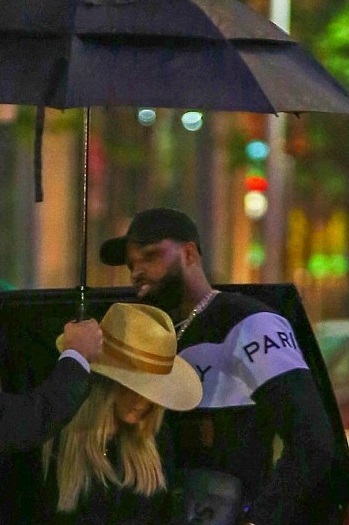 But Khloe Kardashian and Tristan Thompson weren't afraid of a little rain as they headed out to a friends birthday party together in Cleveland, Ohio on Saturday night. The 33-year-old reality television star seemed to be in great spirits as she hurried into the festivities with her boyfriend amid multiple cheating allegations against the professional basketball player. Khloe and Tristan - who have been dating for more than one year and recently welcomed daughter True into the world - were ushered into the party under a massive black umbrella. The Good American designer trekked ahead of her boyfriend wearing a long black duster with thigh-high black leather boots. She kept her long blonde hair partially covered with a wide-brimmed fedora which featured thick, khaki-colored bands around the top. Kardashian carried a light pink leather purse in one hand, showing off a sparkling diamond ring and her manicured hands. Tristan followed closely behind dressed comfortably in a navy blue-and-grey sweater with matching track pants.